The DVD videos are available on Safari. Please click here. Pioneering computer graphics author Deke McClelland updates his bestselling hands-on tutorial for Adobe Photoshop CS3, the latest version of this industry-standard image editing and production program. 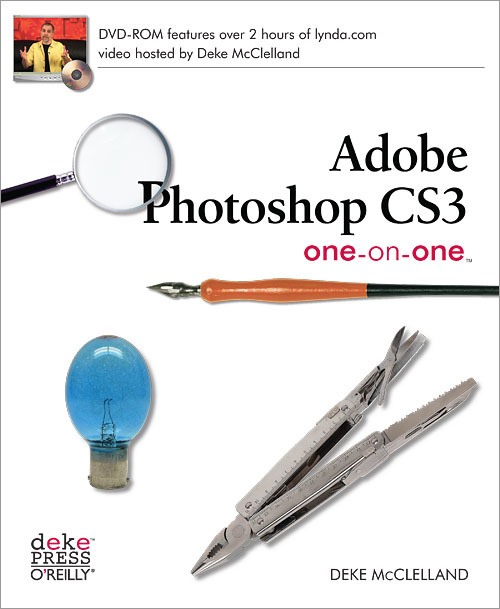 As with previous editions, Photoshop CS3 One-on-One guides readers step by step through the program's features and functionality. A key appeal of the One-on-One series is the two hours of DVD-video material included. Once you read about a particular technique, you can see how it's done first hand in the video. The combination is uniquely effective. And hugely popular. A Photoshop expert, sought-after computer graphics and design lecturer and author of over 70 books, Deke creates a classroom environment in Photoshop CS3 One-on-One with written instruction and video training -- except that you get one-on-one attention as you proceed from lesson to lesson at your own pace. It's like having private lessons with the author. Whether you're an enthusiast, prosumer, creative pro, technical pro, or newcomer, Deke's book will have you speaking fluent Photoshop CS3 in no time.